One of those catalogs is an 1880 trade catalog by John Wilkinson of Chicago, Illinois. 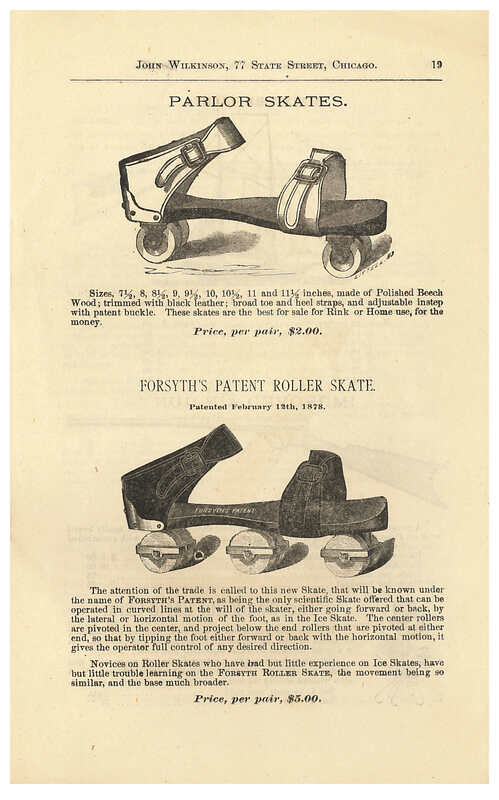 The title is Archery, Lawn Tennis, Games, Home Amusements, Bicycles and Velocipedes… As shown on the front cover, the company sold a variety of equipment for sports and recreation, everything from footballs and baseballs to roller skates and bicycles. John Wilkinson, Chicago, IL. 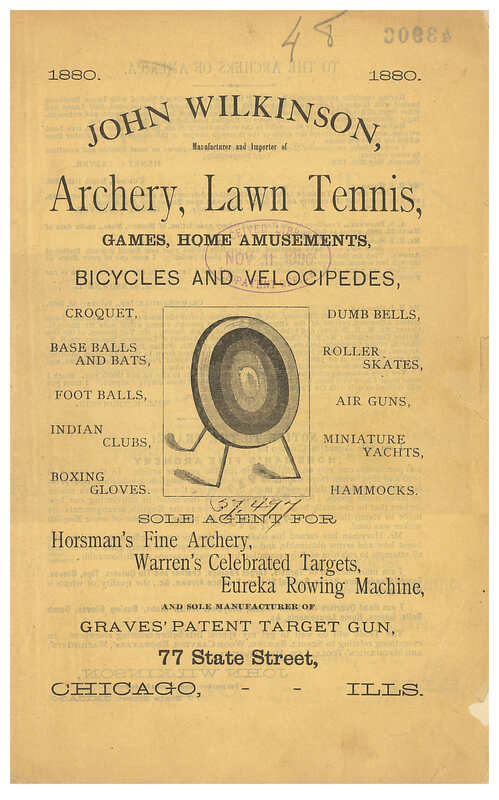 Archery, Lawn Tennis, Games, Home Amusements, Bicycles and Velocipedes…, 1880, front cover of catalog showing a target for archery. One item was the Otto Bicycle. The seat of this bicycle was positioned almost directly above the center of the front wheel. Take a look at the image below to see more detail. According to the catalog, this arrangement meant “a much larger wheel can be ridden, thus giving more speed by less power and easier movement.” There were eight versions of this bicycle. The first two models were designed for boys, the next two were primarily for youth aged fifteen to twenty years old, and the others were designed for adults. John Wilkinson, Chicago, IL. 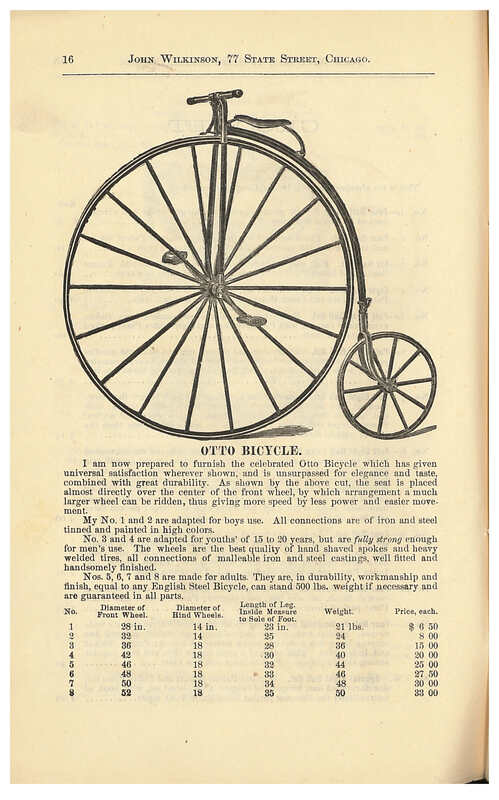 Archery, Lawn Tennis, Games, Home Amusements, Bicycles and Velocipedes…,1880, page 16, Otto Bicycle. 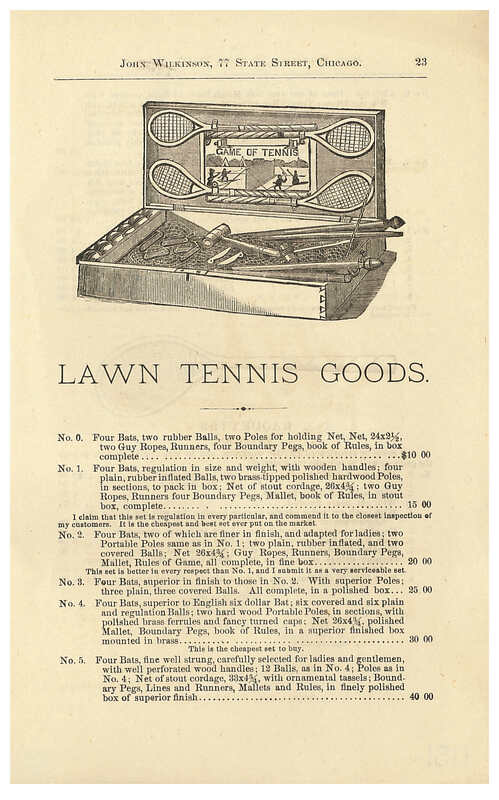 John Wilkinson also sold lawn tennis sets. These sets included everything necessary for a game of lawn tennis or badminton. The sets included the net, poles, boundary pegs, and book of rules. John Wilkinson, Chicago, IL. Archery, Lawn Tennis, Games, Home Amusements, Bicycles and Velocipedes…, 1880, page 23, Lawn Tennis Sets. John Wilkinson, Chicago, IL. Archery, Lawn Tennis, Games, Home Amusements, Bicycles and Velocipedes…, 1880, page 19, Parlor Skates and Forsyth’s Patent Roller Skate. And, finally, this catalog gives us memories of warm, relaxing spring and summer days with these images of people reading and sleeping in hammocks. The company sold several styles of hammocks, including the American Pocket Hammock and the Baby Hammock. John Wilkinson, Chicago, IL. 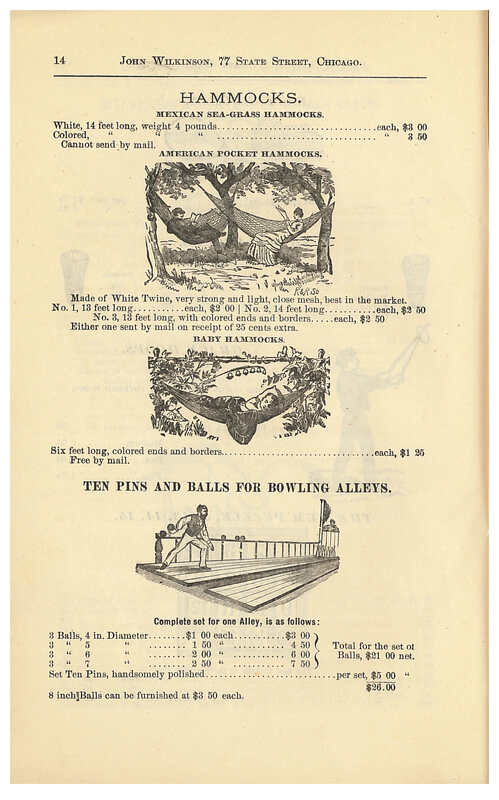 Archery, Lawn Tennis, Games, Home Amusements, Bicycles and Velocipedes…, 1880, page 14, hammocks and ten pins and balls for bowling alleys. John Wilkinson’s 1880 catalog, Archery, Lawn Tennis, Games, Home Amusements, Bicycles and Velocipedes…, as well as many other sports related catalogs by other companies are located in the Trade Literature Collection at the National Museum of American History Library.